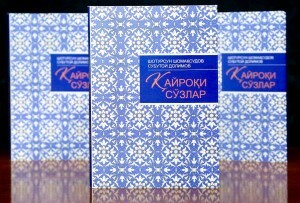 The Karimov Foundation has published a dictionary of Uzbek idiomatic expressions, set phrases and sayings. The edition includes a collection of several hundred expressions, and provides a fascinating and engaging background to their origins and meanings, and explores how they found their way into the Uzbek language. These expressions were collected by the book’s co-authors Shotursin Shomaksudov and Subutoy Dalimov over the course of 15 years, as a result of their countless meetings and discussions with people from all walks of life. The main goal of this edition is to contribute to the preservation of this colourful aspect of the Uzbek language, a real testimony to its richness and eloquence, and an integral part of our people’s cultural heritage. Some of these idioms are on the verge of extinction and we hope that this present edition ensures they are not lost for future generations. Publishing, with a primary focus on works exploring Uzbekistan’s traditions, arts, literature and the intellectual achievements of the Uzbek people, is one of the priority areas of the Karimov Foundation’s work.